Ready for some fun? Break out the Rolaids ’cause we’re going to break WordPress! 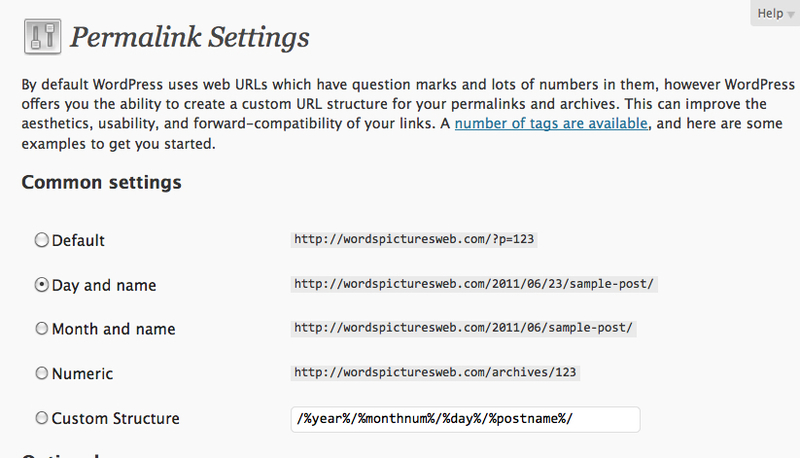 WordPress Permalinks can be found in your Settings tab. If you’re using WordPress, then search engine optimization (SEO) is baked right in (more or less). It’s a good cloud-based application well-optimized for the web. If you’re like me, good enough is never “good enough.” You must over-optimize. Excess means success, right? Good. First, to begin screwing up, go into your Settings. You can cause a ton of damage here. Feel free to randomly click things and break them. There is a special section for “Permalink Settings,” which offers several options. If you’ve been blogging for a while, you probably have a backlog of entries and people may be linking to your blog. If you change this Permalink setting, you’ll change the URL of your posts, which is perfect for completely ruining your inbound traffic. Think about it. 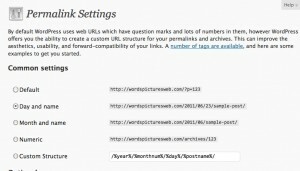 Someone liked your post enough to link to it, so you can now change the location of your post and their outbound link. Good work, you’ve killed two birds with one stone. Changing something structural after you’ve been blogging for three-plus years (like me) will definitely mess up your site. If you’re following along, congrats, you’ve screwed up your website in one click. But there’s more. Add another feature (or two) using plugins. WordPress has an amazing ecosystem of free plugins designed to optimize your blog. Add a few more, since you can never have enough third-party tools taxing your server. I already had ShareThis and decided to try SexyBookmarks instead. This is called “adding more variables.” It’s frowned upon by real developers, but if you’re going to screw up, do it right. That’s another great idiot tip: if something works, fix it anyway. Make it go to 11. Don’t test. Just go to sleep. Forget the time-honored tradition of testing your work. Just click a setting, add a new plugin, feel tired, and go to bed. That’s what I did. In fact, it was going to be pretty busy that week, so the next night I tweaked a few more settings. Again, don’t test. Just go to sleep and hope that the WordPress blog fixes itself. Yawn. All part of the master plan. Instead of testing your work, just add a blog post or two. Admire your work. Share it on Twitter and in LinkedIn to get some incoming traffic. This is just a way of raising the stakes by increasing the number of variables that you have to consider when you notice your WordPress blog is broken. So, when you finally discover something is broken, you need to panic. Soon I discovered that all of my links and tags were creating 404 errors. It’s like my blog had ceased to exist. Then restore things. And turn them off again. Repeat a few times. Also, post a running commentary to Twitter, because that’s really interesting to your followers. You can follow me on @MarketingBuddy. So, if you’ve followed my patented 5-step program, you will have screwed up your WordPress installation. Just like me. Congratulations. I told you so. Yet, there’s clearly a happy ending because I am actually blogging about it. Here’s what happened. I asked my friend Chris Cullmann to look at the blog. He’s a super-smart marketing guy with stunning technology skills. He tried everything to fix it, but I’d actually turned up the brokification to a full 11. Then I remembered that I did one thing right. Yes, that’s right. I did something right. I had backed up my entire blog via FTP. Because of my background from the old days of web development and buggy computers, I have gotten into the habit of backing up. So, I exported all of my posts, since I’d blogged a few times before my “project.” Then I restored the blog from a backup. It took about two hours of deleting and re-uploading, in which time I promised myself that I’d never do something stupid like this again. Naturally, there were a bunch of things that needed to be fixed, including the plugins and WordPress stats, but that was small stuff. But it worked and now I have my blog back. In the end, if you do nothing else today, back up your blog and any other valuable files. You, um, never know when you’ll need to restore your WordPress installation. This entry was posted in blogging, fun stuff, new media, Uncategorized and tagged backup, blogger, blogging, broken, HTML, PHP, plugins, tech support, wordpress, wp by Buddy_Scalera. Bookmark the permalink.